There have been a few noteworthy changes recently beyond the integration of Garmin Connect. 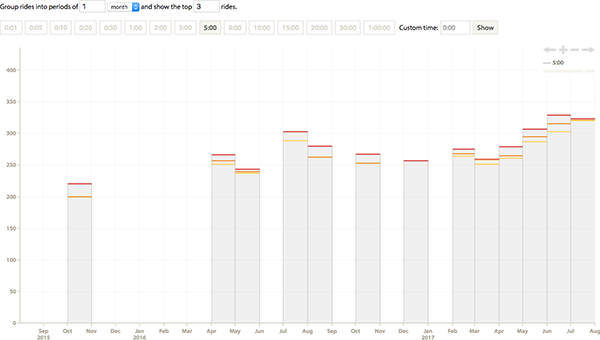 In one sentence: The power history chart has been added, laps can now be edited, Garmin Connect users can choose to only have cycling activities imported, and there is an option for the calendar to show plan titles rather than ride titles when they’re linked. The power history chart shows the best efforts and how they vary over time. By default, it shows the best three five minute efforts (in terms of average power) for each month. It’s quite flexible and isn’t hard to configure to show, for example, the best five efforts of ten minutes for each 60 day period. It’s now possible to edit laps. This can be done with the “edit ride” page. New laps can be added, unwanted laps can be deleted, and lap times can be adjusted. Finally, there is a new option for the calendar to always show the plan title rather than the ride title when a ride is linked with a plan. This is most useful for coaches, because they are often more interested in seeing the plan titles. When this option is used, plan titles are only shown on the calendar, and the ride title is still used in other places like the rides table, analysis charts, and ride pages. This is the blog of Cycling Analytics, which aims be the most insightful, most powerful and most user friendly tool for analysing ride data and managing training. You might be interested in creating an account, or following via Facebook or Twitter. How does your cycling power output compare?